Note: these returns are the personal returns of Sam Fetchero, not client returns. If an investor used Peer Lending Advisors to select loans for them and they experienced the same returns, net returns would be lower by 1.5% of assets (for asset-based fee) or 15% of profits (for peformance-based fee – for qualified clients only). There is potential for both profit and loss. Returns continue to remain strong. Over the past few months, continued the run-off loans purchased on the secondary market and continue to ramp up purchases of new loans. The portfolio has become more heavily weighted toward newer loans, which have a different charge-off curve than seasoned loans. Additionally, the mix of the portfolio has begun to shift to more loans invested in Prosper. While the portfolio continues to be made up primarily of Lending Club loans, anticipate the trend of more investments in Prosper to continue, as the automated investing tools enable faster confirmations, and there has been a substantial increase in loan volume. Please note that past performance is not a guarantee of future results. One risk on the horizon is the impact of the slowing housing market. While Peer Lending Advisors has stayed away from borrowers in the banking and construction industry, the impact of the slowdown of housing and housing remodeling due to various factors including the government shutdown, debt ceiling, and conforming loan limits will drive some loans bad. Expect the short-term impact on our portfolio to be minimal, and remain cautious long-term. Interested in how Peer Lending Advisors can help your portfolio? 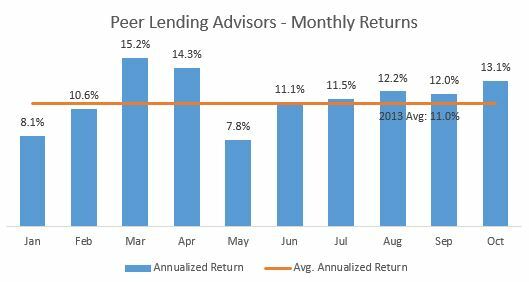 These are personal returns of Peer Lending Advisors, LLC, achieved over the timelines disclosed above in the market/economic conditions at that time. The portfolio objective is to maximize return while minimizing losses, especially in recession scenarios. Loans were purchased on both Lending Club and Prosper.